Featuring delicate lacy shells and romantic scalloped edgings, Ava is elegantly feminine and stylishly beautiful. With its gentle A-line silhouette and handsome three-quarter length flared sleeves, Ava is a polished pick for dressing up or down. The open-front cardigan is constructed seamlessly from the top down, enabling you to adjust the length of both the sleeves and the body as desired. 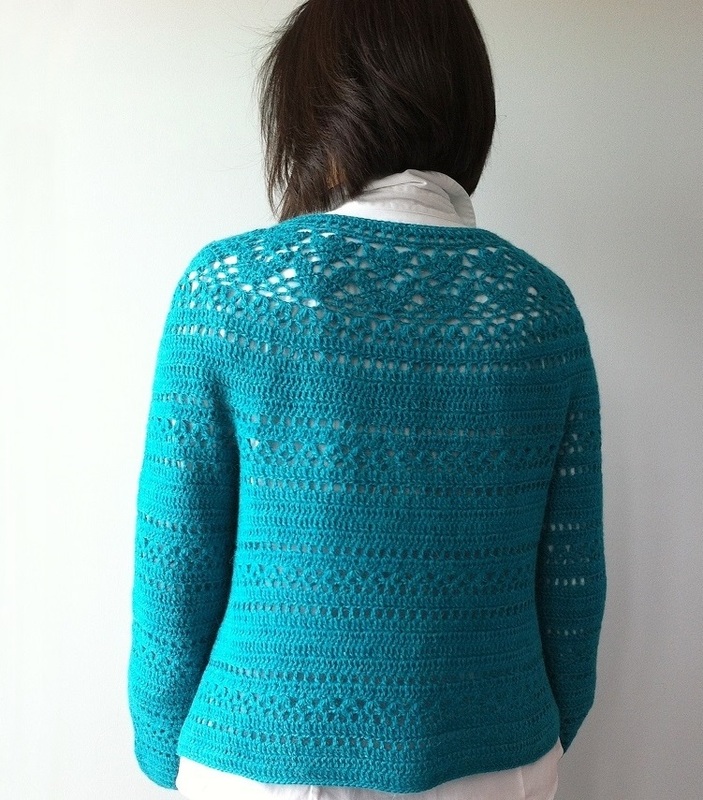 This entry was posted in Pattern Releases and tagged cardigan, crochet cardigan, crochet d, crochet designs, crochet pattern, crochet patterns, lace cardigan, Ravelry, Vicky Chan, vicky chan design, Vicky Chan Designs, Vicky Chan Designs Group on October 10, 2015 by Vicky Chan Designs. It seems like a long time ago when Clair was released. I have done lots of bad stuff (mouwahaha) with this latest project of mine – frogging many times and taking lots of breaks. 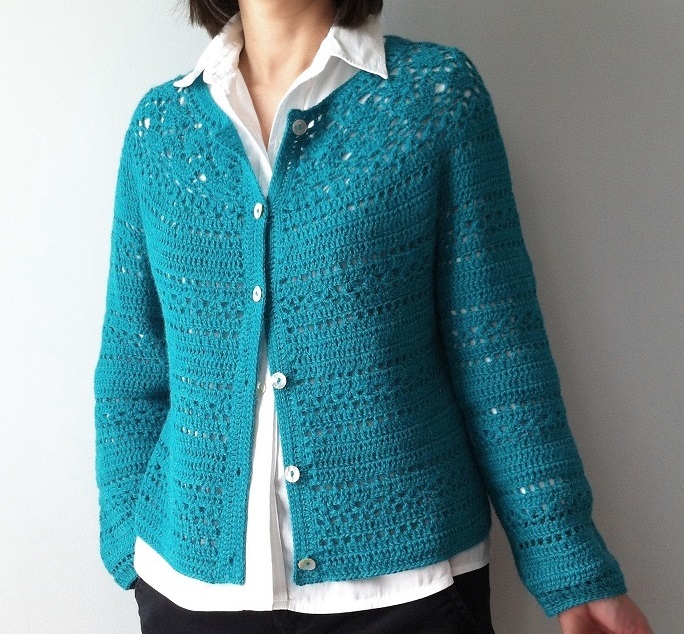 This entry was posted in Uncategorized and tagged cardigan, crochet cardigan, crochet design, crochet designs, crochet pattern, crochet patterns, lace cardigan, Vicky Chan, vicky chan design, Vicky Chan Designs on August 3, 2015 by Vicky Chan Designs. I’ve just finished my fifth Irene cardigan, and I still enjoy making it. This is a full length long sleeve version that can be buttoned up all the way. This entry was posted in Finished Objects and tagged cardigan, crochet cardigan, crochet design, crochet designs, crochet floral lace yoke cardigan, crochet pattern, crochet patterns, floral lace, lace cardigan, Vicky Chan, Vicky Chan Designs on December 14, 2014 by Vicky Chan Designs. 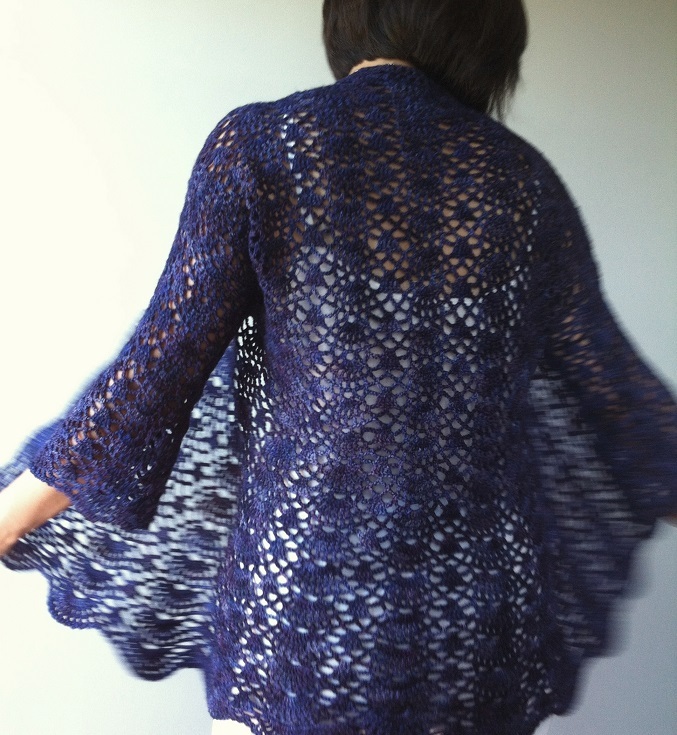 These patterns are 20% off until July 31, 2014 for the CANADA KAL 2014 on Ravelry. Please see here for details. This entry was posted in News or Events and tagged crochet designs, crochet patterns, promotion, sale, Vicky Chan Designs on July 25, 2014 by Vicky Chan Designs. After designing Angela for my daughter, I wanted a similar cardigan (but with floral details) that is easy to throw on in a rush for the morning or going out. Arianna sure does the job for me! In drapey kimono style and with elbow length sleeves , Arianna is full of flower power – dainty cheery blooms brimming all over, plus a beautiful floral lace yoke on the back. It can also be worn “upside down” (as shown in photo below on the right) with extra fabric around the neck for additional warmth and coziness. Also, thanks to Mr Antonio Gonzalez-Arnao’s generous support, the beautiful Malabrigo Sock yarn used for this cardigan has made my project a wonderful experience. I love the floral stitch pattern I specifically designed for Arianna so much that I have restyled it into a more open lacework for a spring/summer garment. Julia is the end result – a chic feminine A-line tunic with moderate hi-lo hem and yoke, made with breezy cool linen. I’m so ready to say goodbye to the Winter with all this blooming flower power! More details to come when these 2 patterns are released. If you are interested in these 2 designs and would like to be notified when they are available, please subscribe through here. This entry was posted in Uncategorized and tagged cardigan, crochet cardigan, crochet design, crochet designs, crochet knit combo, crochet pattern, crochet patterns, crochet tunic, floral lace, knitting pattern, Ravelry, tunic, Vicky Chan Designs on April 18, 2014 by Vicky Chan Designs. I am excited that my new blog is up, and am happy to introduce my two latest designs in my very first blog post. If you enjoy this blog post and wish to view more of my designs, please see my PATTERNS page or visit my online Ravelry Store for more details. Iris came about when I wanted a simple scarf to loop twice cozily around my neck in one of my favorite colors. To add interest, I decided to embellish the scarf with a lace border in off-white. In the end, I liked the fern lace border so much that I extended it to the remainder of the scarf but in a simpler variation. Though a tad more elaborate than originally planned, the final rendition proved to be more interesting to knit. Above all, it is as beautiful as it is fun to wear. Loving the floral lace of Cynthia and Jennifer, I have carried the floral theme into Irene. 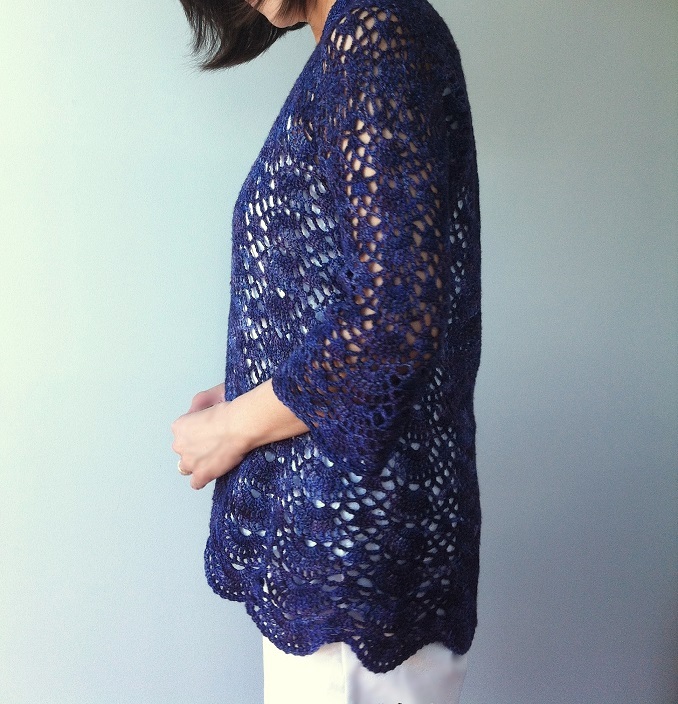 To complement the beautiful floral lace yoke, a simpler lacy stripe pattern was designed for the rest of the cardigan. Irene by far might be my most favorite pattern as I am planning to make another one with summer yarn. It’ll probably be fun to wear it to the Tulip Festival this spring to see the lovely blooms. 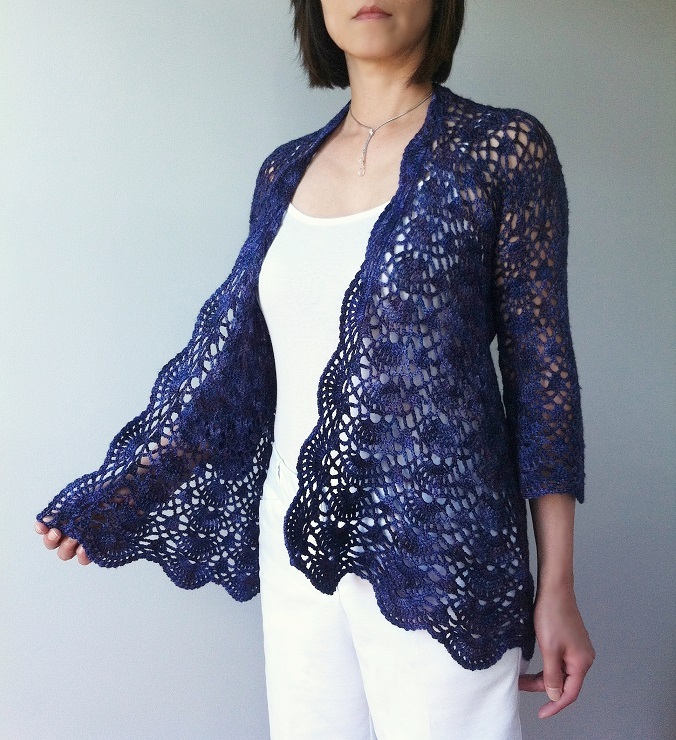 This entry was posted in Pattern Releases and tagged cardigan, crochet designs, crochet pattern, crochet patterns, floral lace, knitting design, knitting patterns, Ravelry, Vicky Chan Designs on February 16, 2014 by Vicky Chan Designs.